For any Dubaian, there will come a time when there is an overwhelming urge to get away from the bright lights, big city. It’s easy to forget that within an hour, one can find tranquility in the stunning UAE desert with its multicoloured sand, speckled with goats and some roaming camels. Continue on and you’ll soon come upon the Emirate that is currently stirring things up and giving Dubai a run for its money. Meet Ras Al Khaimah – the rather naughty Emirate which is also home to the Cellar bottle shop. Need I say more? The Emirate seems to appear out of nowhere from the scenic UAE landscape. A cluster of luxurious hotels, Al Marjan Island, a handful of shops, and finally, the Canary Diamond of the Desert – The Waldorf Astoria Ras al Khaimah! Although Dubai and Abu Dhabi are top destinations, RAK is not to be overlooked. Just 45 minutes from Dubai International Airport, it’s the perfect luxury holiday destination, offering serenity, calm, and natural beauty. This Emirate is particularly unique in that it offers all four of the different landscapes found in the UAE: plains, mountains, beaches, and deserts. His Highness Sheikh Saud Bin Saqr Al Qasimi, Ruler of Ras Al Khaimah, member of the Supreme Council of the United Arab Emirates and Waldorf Astoria owner, is on a mission to make this Emirate a talked about destination whilst maintaining its unique traditions and beauty. RAK is ideal for those looking to take a holiday from Dubai, as well as for business execs seeking refuge among mountains like Jebel Jai (UAE’s highest peak) and the coast. From playing golf at the Al-Hamra Golf Club to taking part in team building activities like water sports or equestrian adventures, RAK offers plenty to do. I had heard average things about the Waldorf Astoria Dubai Palm Jumeirah (mainly about the service and how it was missing those finer touches expected of a luxe hotel), so Pra went in with a branding mindset, ready to do a deep cleanse brand review. It’s easy to get there…if you use Google Maps and NOT your Lexus in-car navigation kit, that is! It took us 1.5 hours to get to RAK and that included a fuel stop and a dawdling drive as we snapped away at the camels and wildlife en route. As we pulled up, our first impression was “WOW”. Located near the Al-Hamra Golf Club, the Waldorf Astoria looks a bit out of place with its sprawling opulence that screams “this is going to cost you but you’re gonna love me”. Looking at the valet service made it seem like I’d accidentally walked into an episode of Top Gear’s Luxury Vehicle show. 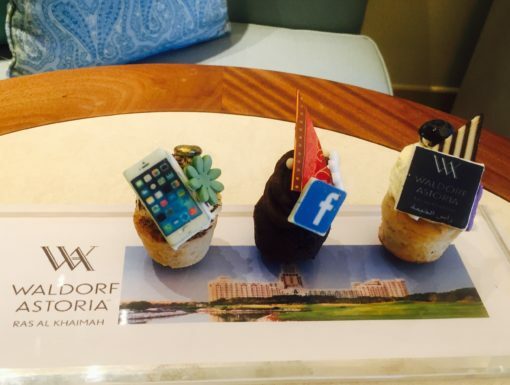 It certainly confirmed one thing – that a LOT of local Emiratis are loving the Waldorf! The valet service was super smooth as the staff handled an influx of metal in one go without a hint of fluster. Three words: What. A. Clock! 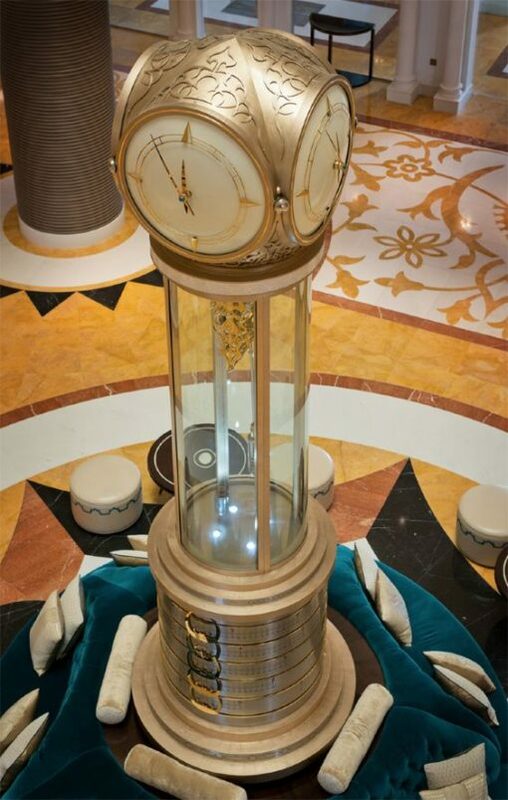 As soon as you walk into the Waldorf Astoria Ras Al Khaimah, you’re greeted by the most magnificent clock, which took clockmaker Smith of Derby 8 months to make. Built from 3 tonnes of metal, steel, and champagne gold, the clock is based upon the ancient astrolabe. It was specially designed to honour the Arabic culture, with the inclusion of the five daily prayers times and an inscription of a well-known ancient Bedouin poem – “from your homeland travel abroad to find glory”. 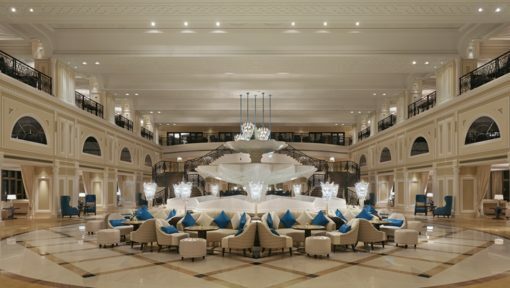 It is the “pearl” to the lobby’s pearl diving theme, and its surroundings are accents of blues and turquoise reminiscent of the ocean. If you’ve been to the Maldives or Seychelles, think of the view on the best, most bluest day – that’s the interior concept of this Waldorf-Astoria. 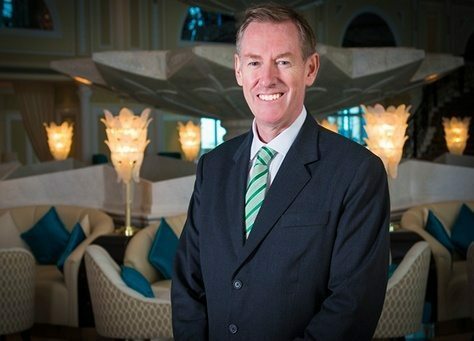 I had the chance to chat with the general manager, Andre Herrenschmidt, a passionate professional with 30 years of hospitality experience that spans 3 continents and 8 countries. He described the Waldorf Astoria RAK as “a palatial hotel in an authentic destination” and it’s clear he’s very proud of the operation that he is running, from the staff to the design. He noted that the Alhambra Palace in Spain was a source of inspiration for the hotel’s design, and Arabic details are seamlessly combined with western influence to create a harmony between the two worlds. The thematic and lush interior design reflects a clear influence of the local environment and continues throughout the hotel. Cream colours for the beaches, golds for the desert, and reds for the Jebel Jais mountain range. Knowing the inspiration and stories behind all of these details makes this place feel all the more romantic. The beautiful Peacock Alley lounge located to the right of reception, complete with a pianist in the evenings, adds an extra va-va-voom to the experience. Check-in was slow but I’m going to cut them some slack here. Due to an influx of guests, it looked like they were short-staffed by two, but the four staff on duty checked guests in with true 5-star service. Besides, the delay gave me the chance to snoop down the alley of luxurious shops that includes a real estate office, jeweller, and a proper Toni&Guy salon! Once we finally checked in, we were smoothly greeted by a dapperly dressed gentleman named Mohammed, who then introduced us to our sanctuary for the night. On the way to our suite, the expansive 4th-floor hallway left me wishing, for just a moment, that I’d been a carpet supplier! It was an impressive space that could compete with the Grand Mosque Carpet in Abu Dhabi. Our junior suite was one of 346 deluxe rooms and suites. Pra just about died and went to heaven when the door opened up to a stonking walk-in wardrobe! There was a beautiful living room that then flowed into a dining area, complete with a lovely fruit arrangement. From there, we waltzed into a stunning and well-sized bedroom, which had another huge wardrobe space and a second bathroom. This suite was not only generously sized, but it was well-designed, from the turquoise blown glass knobs and rippled mirror frames, to the beautifully engraved headboard and super fabulous stag coral light shades continuing the underwater theme. Princess Pra donned a Boca Terry luxury dressing gown and drenched herself in Ferragamo bathroom amenities before sampling the gorgeous complimentary spread of chocolate and pistachio bars and divine-looking cupcakes! The “room experience” had every brand aspect covered. The only thing I missed was a balcony (which comes with a number of other rooms, just not ours). But no matter, because it was time to sample a unique Hawaiian Blue Tea in Camelia’s Tea Room, which has a balcony from which the most awesome sunset can be seen whilst enjoying a cuppa, vino or some shisha. You can see why this hotel is a hit, not just among locals and couples/friends on staycations, but with the business crowd looking for the perfect combo of form and function. Why use a cold, lifeless function room when you can have an outdoor garden party? As an ex-corporate slave, I know which I’d prefer! 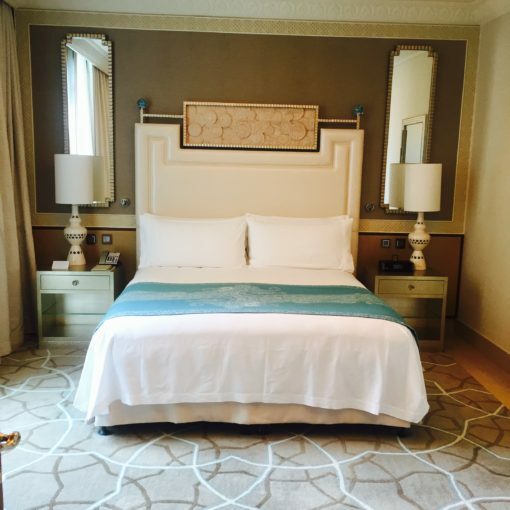 You name it and the Waldorf Astoria RAK will be sure to delight. From luxe weekend offers such as a desert safari, individual or team cooking classes to some divine pampering. The list is endless (and I would now officially like Katie the PR Manager’s job!). What about the food and the spa? Read Part II here!